This is quite a unique chocolate fudge cake to me as the chocolate fudge is cooked using mainly milk, custard powder and cocoa powder. 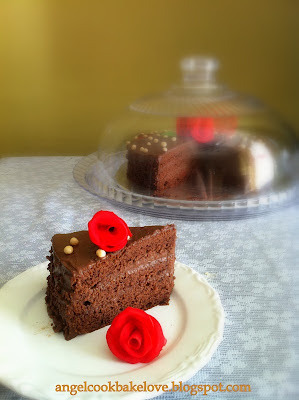 It is not very chocolaty but blend in well with the chocolate sponge cake. It is creamy and kind of melt-in-the-mouth. You can have second or third serving of this cake without feeling guilty. Skip this if you want something very chocolaty. Prepare one 23cm or 20cm round chocolate sponge. 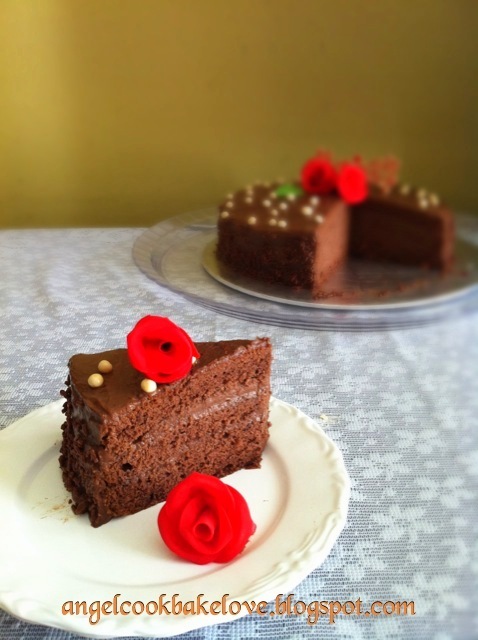 You can use any chocolate sponge cake recipe. I didn’t follow the sponge cake recipe from the same book. For 23cm round cake just use 5 eggs and increase the amount of the rest of ingredients proportionately. 1) Using an electronic mixer, whip eggs and sugar until light and fluffy (ribbon stage). Add vanilla extract. 2) Fold in flour/cocoa powder mixture with a hand whisk till well blended (no trace of flour). 3) Add warm melted butter and mix well. 4) Pour batter into a greased and lined 8” round pan. Bake in preheated oven at 180C for 25 mins (I lowered to 170C after 10 mins). Remove it from mould and cool on wire rack when done. 1) Sift custard powder and cocoa powder in (A) into a saucepan, then mix well with milk in (A). 2) Cook (B) over medium heat and bring to a boil. Pour it slowly into (A) from step 1, stir with a hand whisk until well blended. Cook the mixture over medium low heat, stir from time to time until it thickens. 3) Remove from heat, add (C), mix well. 1) Cut sponge cake into 3 layers (original recipe cut into 4 layers but I think the chocolate fudge may not be sufficient). Sandwich the cake layers with chocolate fudge and level it. Frost the whole cake with remaining chocolate fudge. 2) Coat the side with chocolate rice (optional) and decorate as desired. Set aside to cool and chill. Take out the cake 3-5 mins from the fridge before serving. 1) The chocolate fudge will be thickened (which make it difficult to spread) once it cools down. Give it a quick stir each time before spreading help to make it become runny again and hence easier to spread. 2) The chocolate fudge will kind of set after frosting, so need to work on it fast. Do not attempt to smoothen it after it is set, this won’t help. Instead, the surface will become more uneven. 3) The sponge cake was made on 10th May, I tasted the cake this morning, and it was still soft and moist. You are right, this kind of cake can eat more at one time. You have nicely decorate this chocolate cake..well done. What a pretty chocolate cake! 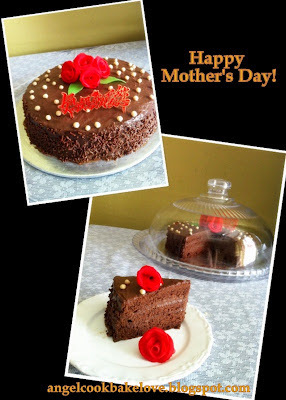 The name of the cake sounds so classy, Imperial Choc Cake, I like~The cake was decorate beautifully too! I was first attracted by the name when I browsed the book. Sure. I shall exchange with your marble cheesecake. Good deal! wanna keep this for my sis's birthday next week. thanks for sharing such a wonderful cake! You are welcome! Hope your sis will like it.